Nikolai Gogol cracks me up. Our senses of humor are so in-tuned that I think we’re kindred spirits. Maybe we’re even related somehow. It could be true. I’ve heard it argued that comedy once came from those on the lower rungs of the social ladder looking upwards at the antics of their social betters. You can see this in Charlie Chaplin, the Marx Brothers, even in Moliere, and certainly in Nikolai Gogol. I think the comparison with Moliere is most fitting. More on that later. 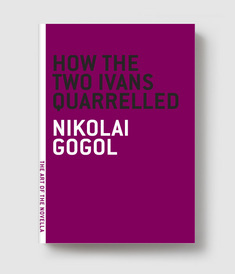 In How the Two Ivans Quarrelled, Mr. Gogol tells the story of two life-long friends, both named Ivan, who live on adjoining estates. Both are among the richest, most prestigious men in their small Russian village. One day, after cleaning out a long forgotten trunk, one Ivan hangs his old military gear, uniform and gun, on the line in his yard to air out. (Yes, he airs out his gun.) Because the other Ivan admires the gun, he asks if he can have it, offering to trade a sow and two sacks of grain. The first Ivan is offended at the implication that is gun is an old pig, an argument ensues ending with one Ivan calling the other a goose. This is so insulting that the two never speak to each other again. Instead, they each file competing lawsuits, accusing the other of everything from defamation to attempted murder. The townspeople are aghast. The situation is ridiculous on its face, much like those in Moliere’s plays such as The Miser which features a wealthy man so tightfisted his home is literally crumbling down around him because he is too cheap to pay for repairs. This makes it easy to dismiss the characters in Moliere and in Gogol as so extreme they are outside the realm of believability. We can’ t learn anything from their behavior because they are not enough like us. What they’re doing doesn’t apply to people like us. The fact that Gogol’s Ivans and Moliere’s Miser are all rich adds to their distance from everyday audiences. It’s safe for us to laugh at them without fearing recognition of our own foibles. This character is too extreme to truly offend anyone, I claimed one night. C.J. promptly informed me that The Miser had more walkouts than all but one of the shows he managed in the two plus years he worked for Berkeley Rep. Many people found it hit much too close to home, became insulted and left. I think How the Two Ivans Quarrelled works the same way. On the surface, it’s a very funny story with characters so extreme they can’t possible apply to everyday readers. Look a little closer, not at the story but at your self, and you may find they hit very close to home. How many times have you ended a relationship because someone called you a ‘goose’ or something just as ridiculous? I first posted this review on my old blog, Ready When You Are C.B. for The Art of the Novella Challenge hosted by Nonsuch Book back in 2011. I thought I’d run it again now since I’m spending the month of October trying to make a serious dent in the stack of novellas my TBR shelves. A few years ago I stopped keeping all of the books I buy after I read them. My house was well past maximum book storage. I decided only to keep books I seriously thought I might want to read again after I retire. I’ve got just about all of Gogol’s books now, saved for retirement. He’s one of a handful of authors I probably will read again. He’s fantastic.